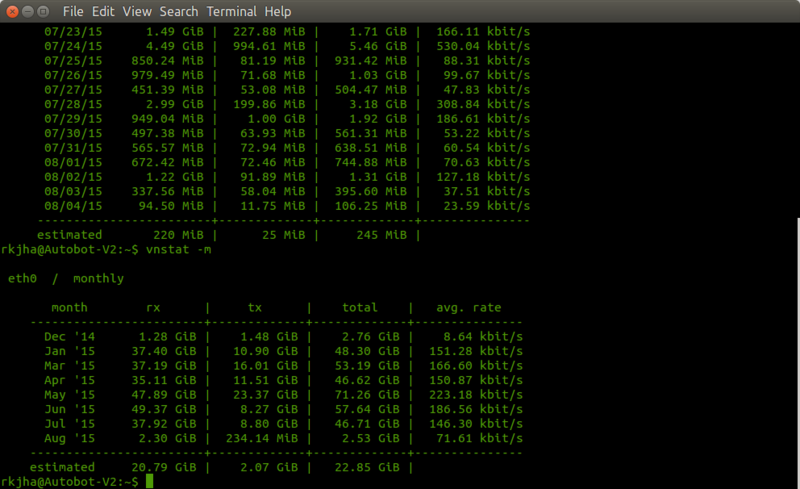 vnstat is a simple command line utility for monitoring bandwidth usage in Ubuntu or any other Linux based distributions and BSD. It’s a very handy tool for keeping an eye on overall bandwidth usage on your system, especially if you’re accessing web over mobile network or you’re using ISP that reduces speed after a certain limit e.g 50 GB (FUP). As you install vnstat, it will start monitoring your internet traffic (default interface : eth0). Simply type vnstat to get an overview of actual bandwidth usage and the estimated usage for next day or month. It will also display the interface(s) it’s monitoring. Fish is a friendly command line shell for Ubuntu/Linux, Mac or any other operating system from the *nix family. 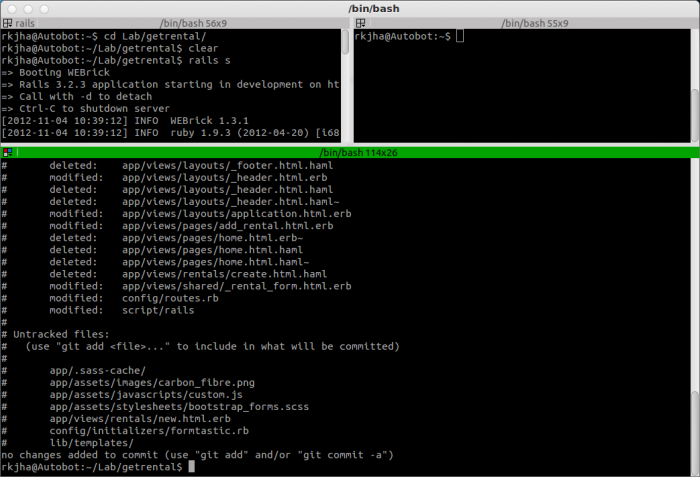 If you use bash (the default shell in Ubuntu) often, then you may want to give it a try. It has lots of smart features you may find productive. Autosuggestions – It suggests commands when you type, based on history and it’ll often save you some time with the commands you type more often. Scripting – Similar to bash but the syntax is much simple, clean and consistent. term256 – it supports 256 colors. Sane defaults – Most of the features will work just fine without any additional configurations. If it’s not available in repository or you’re using other Linux distribution ? Check out official page to download a tarball for your distribution. 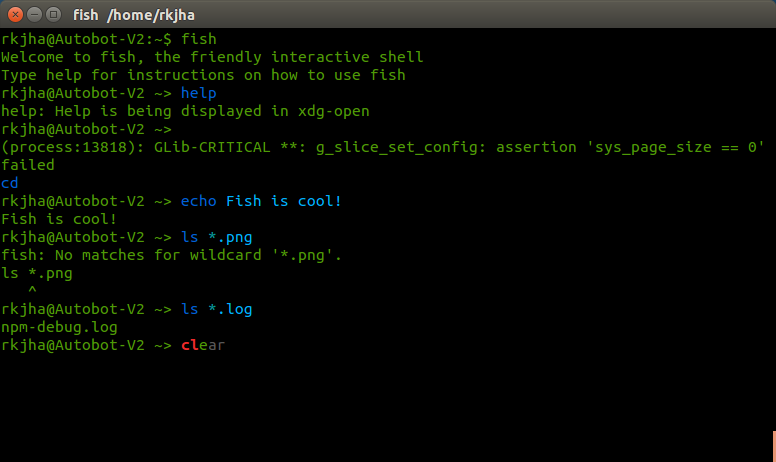 To start fish, simply type fish on your terminal and you’ll jump into the fish shell. Type help and it will open the documentation tab (hosted locally) in your default browser. Also read official tutorials to learn more about the features of Fish Shell. tmux is one of the most popular Terminal Multiplexer (never used it? If you’e a heavy terminal user, then probably you need it) . The latest release is v1.8. Recently I wrote an article on managing multiple terminals with Terminator, tmux is a very similar program but I feel – tmux is more efficeint/faster, specially with vim (or any command line editor such as Emacs). So, whether you already use a similar program or not, you should try tmux. 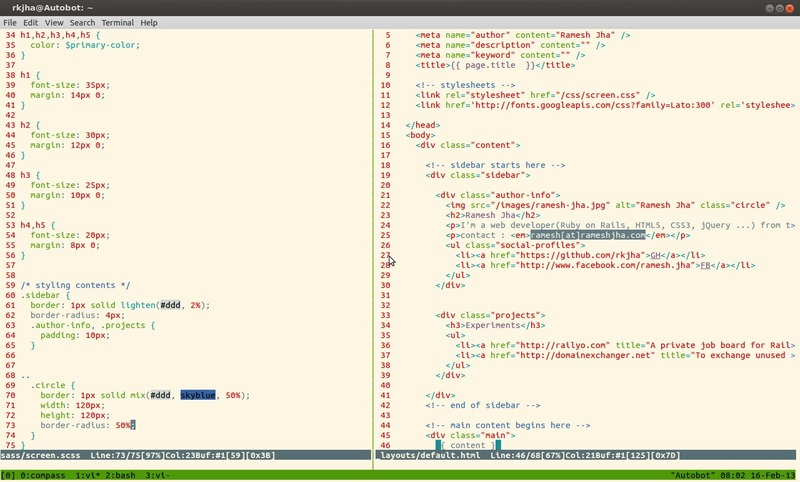 Here is a screenshot (designing my personal blog with jekyll, I’ll launch in next few weeks) using tmux with vim editor. checkout official website for more details. 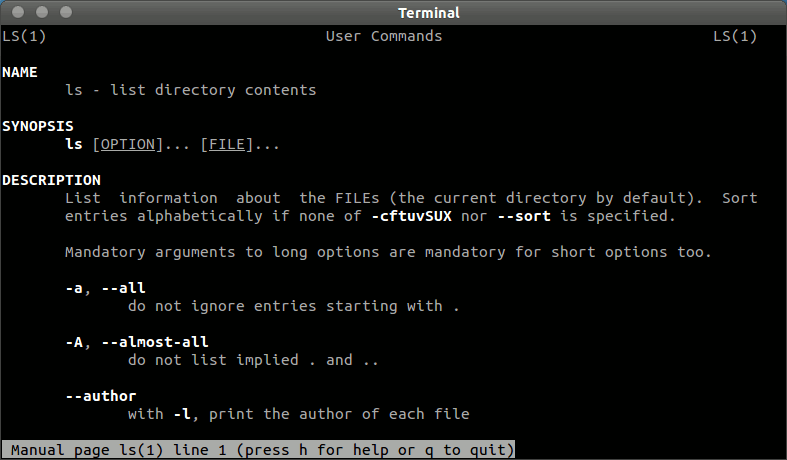 Terminal Commands are cool and very handy sometimes (even for common users who don’t like terminal), also useful in learning some cool stuffs about Ubuntu or GNU/Linux in general (so it’s also good for learners). I’ve prepared a list of few terminal commands – that anyone can learn and master (in couple of minutes), in order to enjoy a better experience with Ubuntu or other Linux distributions (and don’t worry about – the Ubuntu version you are using such as – 12.04 LTS – “Precise Pangolin” or 11.10 or may be the upcoming one – 12.10, because it doesn’t change often unlike the other things in Ubuntu :), same for Ubuntu derivatives such as Linux Mint 13(Maya)). If you want to see hidden files/directories (beginning with dot. ), the use -a flag. Check the manual for more detail (man ls). #4. mkdir : make/create directory. NOTE : it removes directories only if it’s empty, unless you specify -f flag for force deletion. But you must be careful with the arguments such as -r, -f. (-rf is very dangerous). Then enter your user account password, and you would be able to do administrative tasks like root. So if you’re getting any permission error using a command, then adding sudo as a prefix, might help. the above command will move the file from the current directory to target directory. it will rename the file to new_logo.jpg. The above command will copy the movie_name.mp4 to the specified directory. GNU Wget or wget is very handy in downloading stuffs from internet, over the command line. The above command will open nautilus with root privilege. It’s just like sudo, but in GUI mode. where time can be 0 if you want to shutdown now or specify the exact time such as 10:30. These are Ubuntu Specific commands. It Requires root privilege, so just add the sudo prefix before each command (it will ask for the user password and you’re done!). install – To install package. After, adding the PPA, apt-get update command is required.